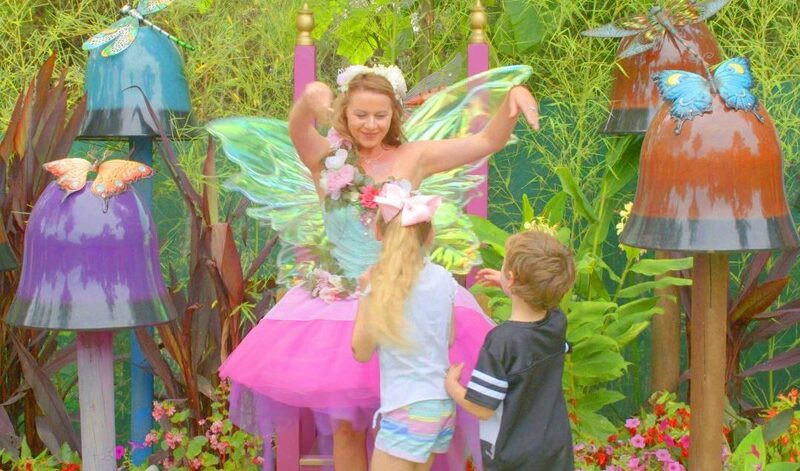 Step into a world of fantasy and family fun when you enter our Flower Fairy Garden, located on the shores of Silver Lotus Lagoon. The flower fairies have been busy building their own village, located near a grove of giant mushrooms and garden beds full of flowers. The fairies have also added a few fun features for little humans including 3 fantasy cubby houses, a rainbow slide, fairy dell wishing well and the Fairy Queen’s magical throne. It also contains numerous lakeside picnic shelters and a BBQ, it’s a great place for families to have a picnic (with the fairies). During weekends and holidays, the Flower Fairy Queen flies in to visit the children and tell them stories about her magical world. Check appearance times for more details. Keep an eagle eye out for our large goldfish and Eastern Long Neck Turtles that live in the ponds.Children can also help us feed the goldfish at 12pm and 2pm each day. Kids of all ages are captivated with the beautiful face artworks produced by our Fairy Queen and others. From flowers to animals, princesses to super heroes, the skilled face painters offer a range of options to suit everyone. Face painting is available on weekends & public holidays from 12pm – 2pm. A small fee is charge for this service. Every kid will love this free activity of discovery, fun and adventure. Our garden Spotto has been designed in a fun way to get kids interested in exploring the gardens and the wonders of nature. Each child receives a sheet and pencil on arrival, the sheet contains clues to a dozen features, animals or plants found in the garden. Once the children have found all the things on the sheet, they can return it to the ticket counter and exchange their pencil for a lolly pop reward.